An exciting new addition to the ever popular area of Fort Kochi, the Xandari Harbour is a restored water-front property located in the heart of the spice trading district, Mattancherry. With the historic ‘Bazaar Road’ just moments away, the property is ideally located for those wishing to explore the nearby art galleries, cafes and spice shops. The location also lends itself well when visiting the other highlights of Fort Kochi. Despite it’s contemporary and modern style, the property pays tribute to it’s historic location and blends well with Kochi’s colonial atmosphere. 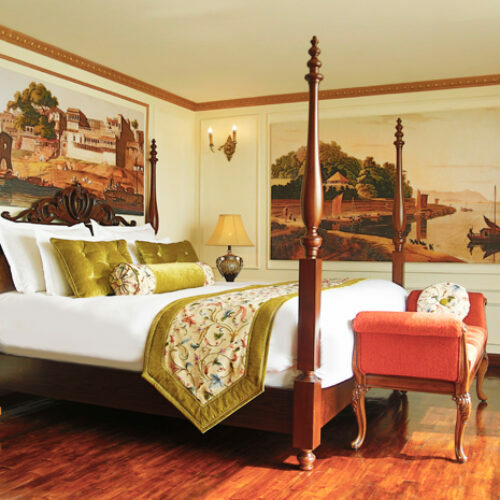 The hotel offers 16 tastefully decorated rooms and suites, with several boasting panoramic views across Kochi harbour. For those wishing to watch the world sail by, there are also suites with balconies that overlook the waters edge, and four of the rooms have private gardens, in which you can fully unwind. All rooms are fitted with a minibar and complimentary WIFI with spacious bathrooms. The restaurant, Xandari 51, allows guests to enjoy a wonderful fusion of Indian and Mediterranean cuisine, known locally as Malabar Soul Food, whilst soaking up the harbour front location. Other facilities at the property include a stylish infinity pool which is the perfect place to cool off after some city sightseeing. Despite being located on the busy harbour front, the Xandari Harbour is a peaceful place to stay and is an ideal base when exploring Kochi. Xandari has a strong ethos of sustainable tourism and supports the local community. Significantly the group work closely with local artists and help to give them a platform, from which to showcase their work. During your stay, you may wish to visit local artisans and galleries which the hotel works closely with. You can also visit some of the local organisations that look after the neighbourhood children, from local schools, civic centres and orphanages.